Future United Nations Development System recently conducted a survey asking 768 leading United Nations (UN) experts and staff around the world to identify what type of Secretary General should be elected this year. Over 80% of the respondents identified ‘political independence, integrity and courage’ as the most important personal quality the next UN Secretary General should have. A major criticism of the UN Secretary General has been the level of influence they face from member States which impacts how politically independent her leadership can be. The recent scandal involving Secretary General Ban-Ki Moon’s decision to remove Saudi Arabia from the ‘UN register of children’s rights’ violators’ is a recent example of the impact political pressure can have on a Secretary General. However, the pressures the UN currently faces increases the urgency for a transformational leader. From the Sustainable Development Agenda which calls for ‘transformational results’ in our world over the next 15 years to the critical reforms needed in the organisation itself, the question is not if we want a transformational leader but how we can ensure the selection of one. I look to the leadership of Antanas Mockus as a successful example of transformational leadership. Mockus is a mathematician, philosopher, former presidential candidate of Colombia, and twice elected Mayor of Bogota from 1995 to 1997 and from 2001 to 2003. Mockus’ unorthodox approach to public policy achieved some incredible results in the city of Bogota. 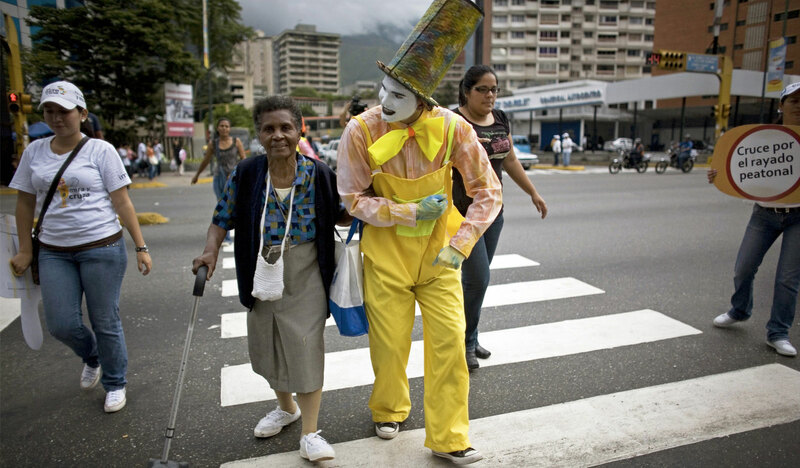 During his tenure, he managed to reduce the homicide rate in the city by 70% (Bogota was at the time, one of the world’s murder capital cities) and replaced traffic wardens with mimes (yes, mimes) leading to a 50% reduction in traffic fatalities. Source: One of Mockus’ policies was to replace traffic wardens with mimes in order to reduce the rate of traffic casualties. Mockus’ achieved these type of results because of two key ideas underpinning his approach to transformational leadership. Firstly, he redefined what the process of ‘change’ was in the context of reform and secondly, he redefined who the agents of ‘change’ were. According to NIE, In order to achieve social order, the formal and informal institutions of a society had to complement each other. Furthermore, successful change within a society required change within informal institutions (moral and social norms) first; an attempt to create change in society through formal institutions which were incompatible with or contradictory to informal institutions could lead to potentially negative results. Mockus adopted this approach to reform ensuring that the formal and informal institutions in the city of Bogota would reify not undermine each other. As explained in the opening quote above, he did this by changing the social norms and moral norms first before creating complementary legal regulations. The candidates currently running for the next Secretary General, propose organisational reforms within the UN without proposing the required change in social norms and moral codes needed to ensure positive outcomes. Without addressing social norms within UN and within global governance first, any legal reforms implemented by the next Secretary General will be short-lived at best and unsuccessful at worst. Social and moral codes are created by individuals and we reinforce them every time we participate in them. They define the incentives we have in behaving the way we do. If you live in the UK, you know that queuing, however, much of a regulation it may appear to be, is informed by social practice and not law. You may see signs from travel authorities on the London Underground requesting you to ‘stand’ (=queue) on one side however this request is not legitimised by the fact that the travel authority has requested it but because as a society, it is a code, a rule we direct upon each other. In using social and moral codes (informal institutions) to design legal regulations and policies (formal institutions), Mockus understood that the agents of change in his approach to policy formulation were not the civil servants or bureaucrats in his government but the citizens of Bogota. One of his most successful policies was a night time curfew he imposed which forced clubs to close at 1 am during the weekend in order to reduce the rate of drink related deaths in the city. When first announced, the reform, was incredibly unpopular. To address this, he took carrots to a local concert of 30,000 people and along with senior public policy makers in his Cabinet, Mockus started to hand out a carrot to each concert goer. In Colombia, carrots are cultural symbols of self-control and moderation. Mockus explained to the concert goers that in taking a carrot, they were practising self-control by going home at 1 am and so, they were saving a life, one person at a time. Mockus changed the perception of this policy reform not by a public campaign highlighting the dangers of drink related deaths, but by emphasising the role of the individual agency in the reform. His approach was to replace the popular view that the reform was an act externally imposed by government (a formal institution) with the idea that policy reform was co-created by every individual in society (an informal institution). By doing this, Mockus’ also changed the nature of policy reform from a negative act (a curfew – an involuntary act imposed upon the citizens) to a positive act (a voluntary act each citizen chose to go home at 1 am). Current reforms proposed by the candidates running for Secretary General focus on a centralised view of change, one imposed by a particular department or level of decision-makers with no attention to the role of the individual in the process of change and their perceptions of reform. Like Mockus did in his tenure as Mayor of Bogota, the next Secretary General will need to redefine the role and incentives of the individual in realising collective change if she wants to achieve truly transformational results within the UN and across the world.